To mark the start of Breast Cancer Awareness month, Diet Coke and its brand ambassador Holly Willoughby have joined forces to kick off ASDA’s Tickled Pink campaign. 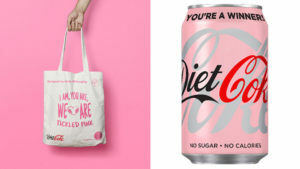 To raise awareness of the ASDA Tickled Pink initiative, Diet Coke has hidden ten limited edition pink cans in special Tickled Pink 30x330ml Diet Coke packs, available in selected ASDA stores and online – with those lucky enough to find one winning £1,000. Shoppers will have a chance to find the Pink Diet Coke Can between the 17th September 2018 and 30th October 2018. Lending her support, Holly has also designed a limited-edition tote bag that features the words “I Am, You Are, We Are Tickled Pink”. Available in selected ASDA stores from the 7th September, the tote bag is free upon purchase of a Diet Coke 4x250ml glass pack. Be sure to get to an ASDA store soon as there are only a limited number available. Launched in 1996, ASDA’s Tickled Pink campaign has raised over £55million to date, supporting the work of the UK’s leading cancer charities, Breast Cancer Campaign and Breast Cancer Care and in 2018, Diet Coke will continue its ongoing support for the campaign with a significant donation.